Did you just get a brand new MacBook? 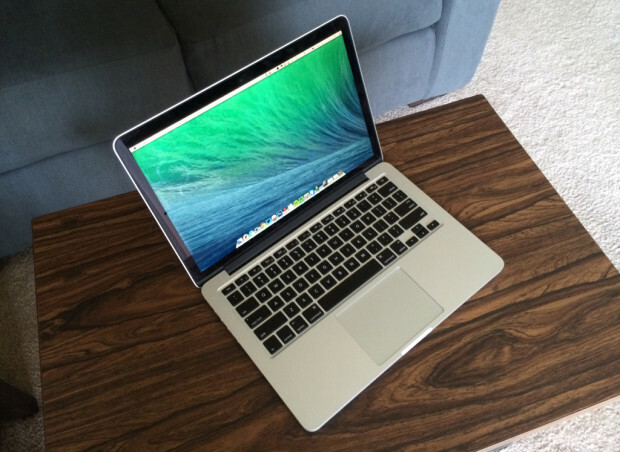 Whether it’s a MacBook Air, MacBook Pro or the new MacBook Apple revived in early 2015 with the new keyboard technology and a Retina display, there are some steps users should take to get the most out of their computer. We’ll show you what happens the first time you start the MacBook and then give you some tips for what settings to change, how to get updates and some accessories to install. Before going too far, sign up for an Apple account. People who already own an iPhone, iPad or iPod Touch have an Apple account. If not, create one at Apple’s website. Doing this early on makes the setup process on the computer easier. Open up the box and plug in the MacBook. It will ship with enough battery life to get started, but it’s still a good idea to charge up the battery to 100%. This is a MacBook Pro charger with a $45 Twelvesouth PlugBug on it instead of the AC connector that comes in the MacBook’s box. Attach the charger magnetically to the left side of the MacBook. 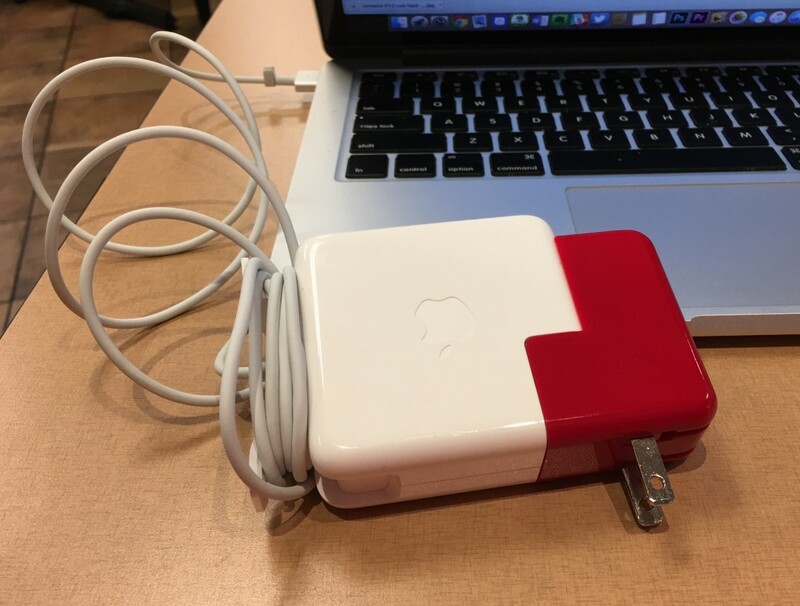 The charger comes with an extension cable that plugs into the wall, but users can also plug the square white brick with rounded corners directly into the wall without the white rubber extension cord. You’ll have to attach the included AC adapter into the brick. Attach the cord if you think you’ll need the extra length or leave it off if you don’t need the extra length. The new 2015 MacBook with Retina display doesn’t include this extension cable any more, but the MacBook Air and Pro still do. Your MacBook will look a lot like the one in the unboxing video below showing the 2013 version. Open the lid and press the power button on the upper right corner of the keyboard. The first time the computer starts, it will ask a series of questions. First, tell the operating system what country you’re in. Then select the language you want to use for your keyboard. A window pops up offering to connect to Wi-Fi. Select your network and add the password, if the network has one. The MacBook will then ask to “Transfer Information to This Mac” and gives options. 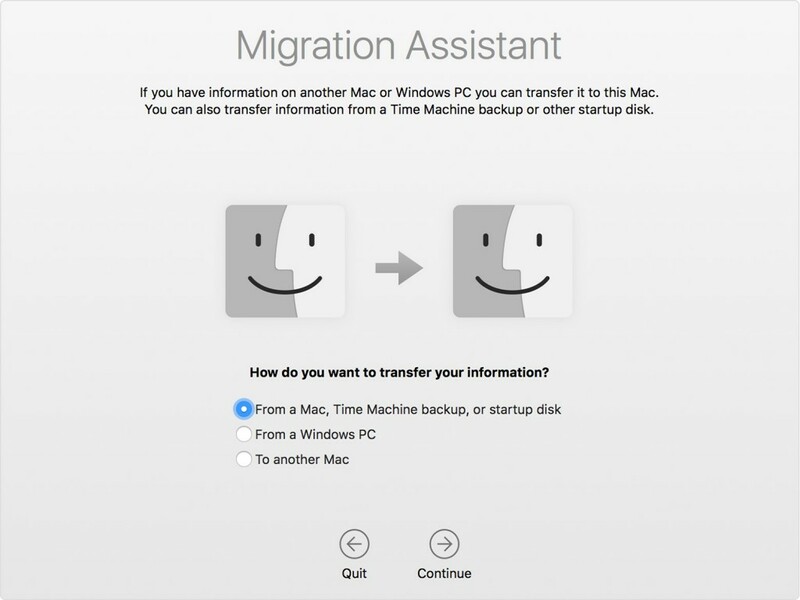 Apple offers a complete guide for using the Migration Assistant to transfer information from another Mac, a Time Machine backup, another hard drive or a PC. The third item seen above lets users copy things to another Mac. You won’t see this on the MacBook the first time you boot. 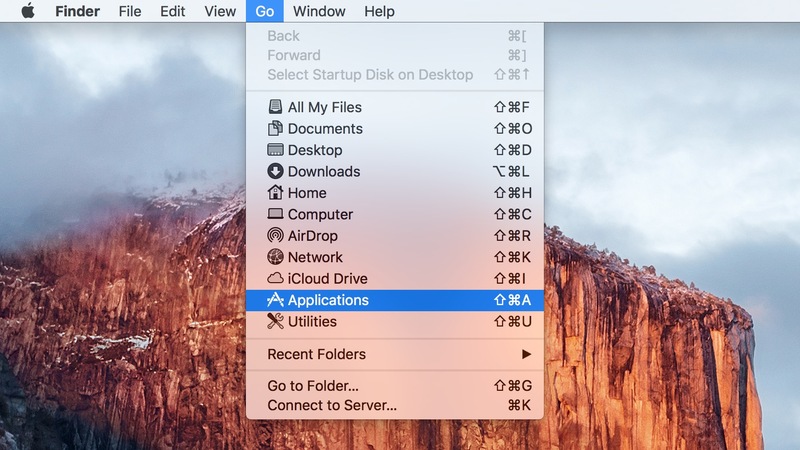 The above screenshot comes from the Migration Assistant app pre-installed in OS X in the Applications, Utilities folder. The one used in the first boot sequences is slightly different, so the third item reads, “Don’t transfer any information now.” Click on Continue to move on after selecting the third item. Why not transfer files now? It’s faster to move files via a USB flash drive like the one recommended below in accessories. Also, starting with a clean system that doesn’t include all the junk we accumulate over time will let the computer run smoother. Take the time to set the new MacBook up manually instead. 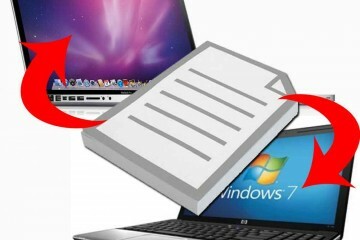 Copy your personal files using something like iCloud Drive, a sync tool like DropBox or OneDrive, or using a USB hard drive or flash drive. Enable locations services – turn this on if you want to use things like Find My Mac or let apps find you to find contextual information related to where you are. Sign into iCloud. 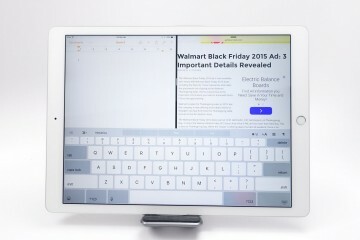 iCloud syncs files from other Apple devices like an iPhone, iPad, iPod Touch or other Macs. This also backs up key information like Photos, settings, and passwords. Turn on Find My Mac which helps you find the MacBook if it gets lost or stolen. Go to iCloud.com to find it on a map. Create a local user account or sign in using your Apple ID. I prefer the local user account and use my first name and a good password to protect my data. I also check the box that asks if I want to use my Apple ID to reset the computer’s password if I forget it. 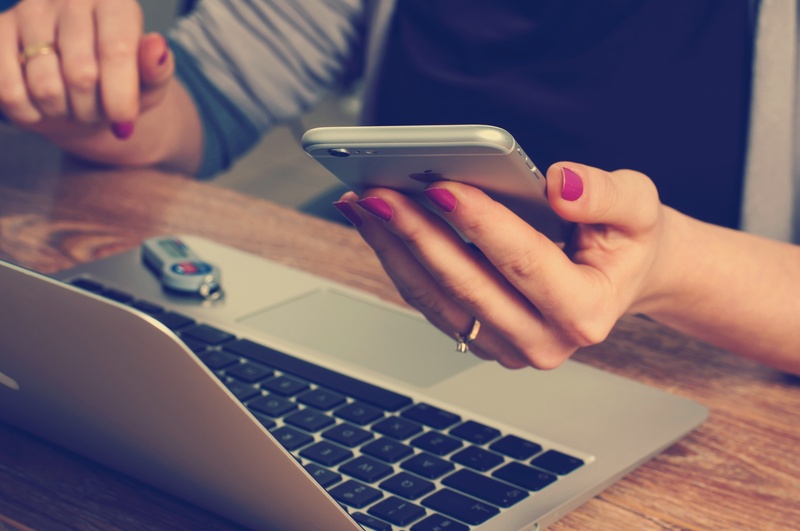 Choose to register the computer, which makes getting technical support easier. The Mac will finish the boot sequence after churning away to set things up in the background. Wait patiently. It doesn’t take a long time to finish. Check out the Apple OS X MacBook quick start manual. It’s got a lot of tips and instructions for using El Capitan. Apple forces the user to sign into their Mac what seems like a hundred times. You’ll do it first during the boot process explained above. 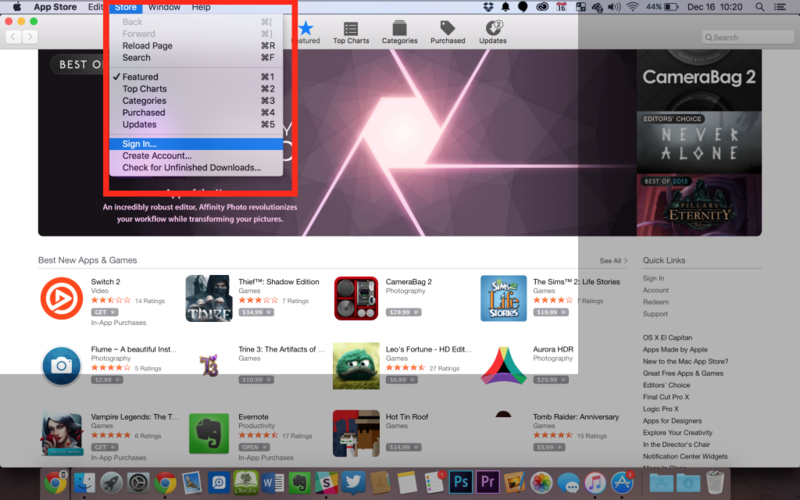 Open iTunes and the Mac App Store app and sign into both so that you can buy media and apps. Sign into iTunes so you can buy apps, music, movies and TV shows. 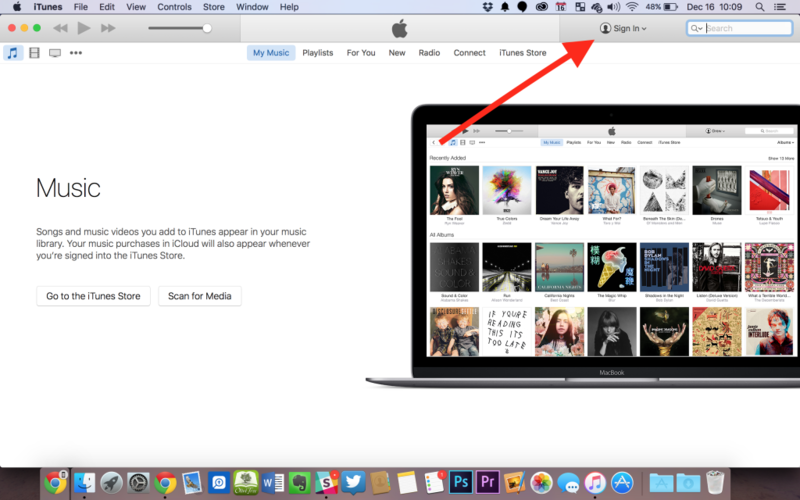 Open iTunes, icon on the Dock with musical note on top of white background. Click on the Sign In button on the top right part of the program. Enter the user name and password for your Apple account. If you share an iTunes account with a family member other than your own Apple ID, you can add that account instead of your account. Click OK when it finishes logging into iTunes. The program will ask you to enter payment information. Add a credit card or PayPal account so you can buy content. If you already added payment information, just confirm it. Apple will ask for your credit card’s security code from the back of the card. Enter your name, address and phone number and check accuracy. Click Done. Open the Mac App Store and click on the Store menu. Select Sign In from the drop down menu. Add your Apple ID and the password and click Sign In. Now it’s ready to download apps. While here, click on the Updates tab at the right end of the top toolbar. Let it search for updates and download any updates available. Open System Preferences from the Apple menu in the upper left or from the Dock on the right end and find iCloud in the second to last row at the left. If it doesn’t already show your iCloud account, which you might have entered during the first boot, sign in now. 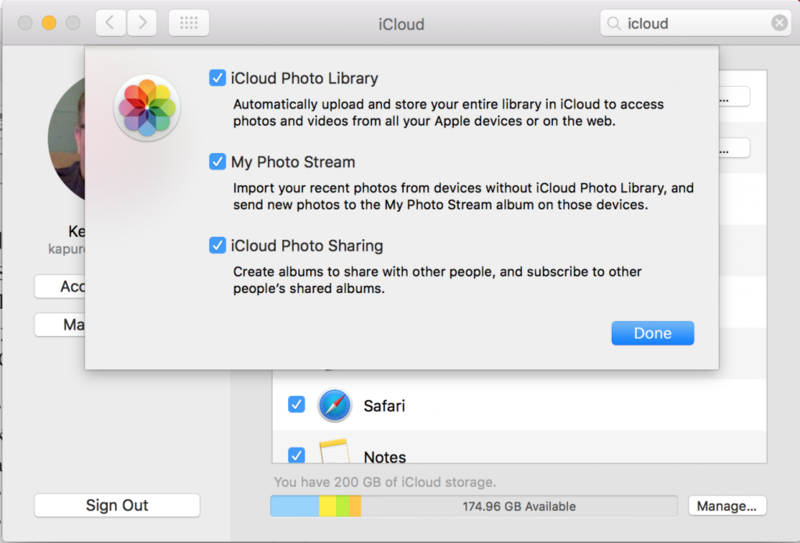 Check off the items you want iCloud to sync. 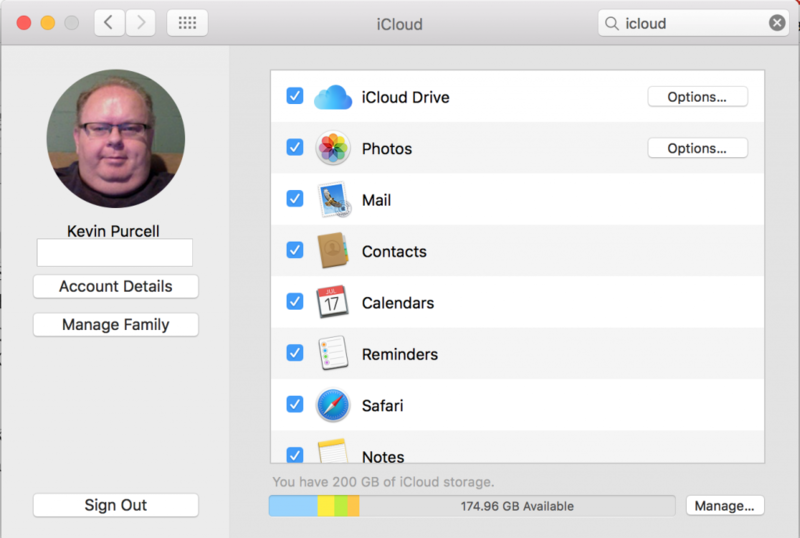 iCloud Drive – syncs files between Macs and iOS devices for apps like Pages, Keynote, Numbers, iMovie and others; the Options button lets you choose which apps can use iCloud Drive. Photos – syncs Photos on Macs and iOS devices. The Options button lets you choose options for turning on or off Photos library and photo stream and shared libraries (see below). 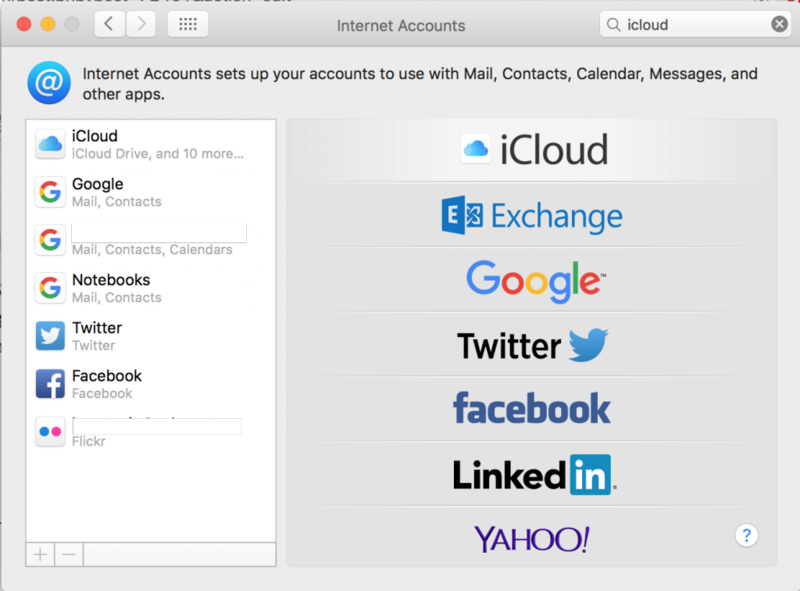 Mail – syncs Mail accounts and email from your iCloud mail account. Contacts – syncs Contacts in iCloud. Calendars – syncs Calendars in iCloud. Reminders – syncs Reminders lists and individual Reminders. Safari – syncs settings, bookmarks and other browser content. Keychain – lets users sync things like settings and passwords; the Options button turns on approving Keychain sync using a security code or a phone. Back to My Mac – lets you remotely control this computer from other Mac computers if it’s turned on. Find My Mac – lets you find your Mac on a map from iCloud.com if this turned on. 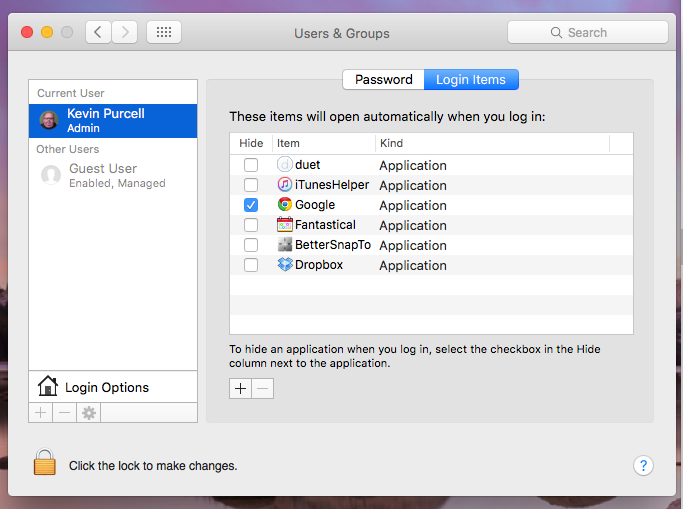 While the System Preferences app is still open, add third-party accounts. 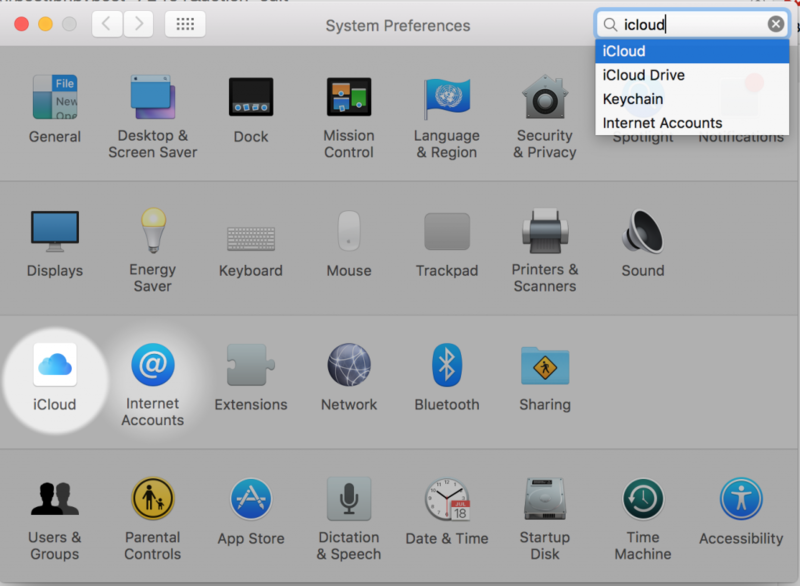 Click on Internet Accounts, the icon right of the iCloud icon. 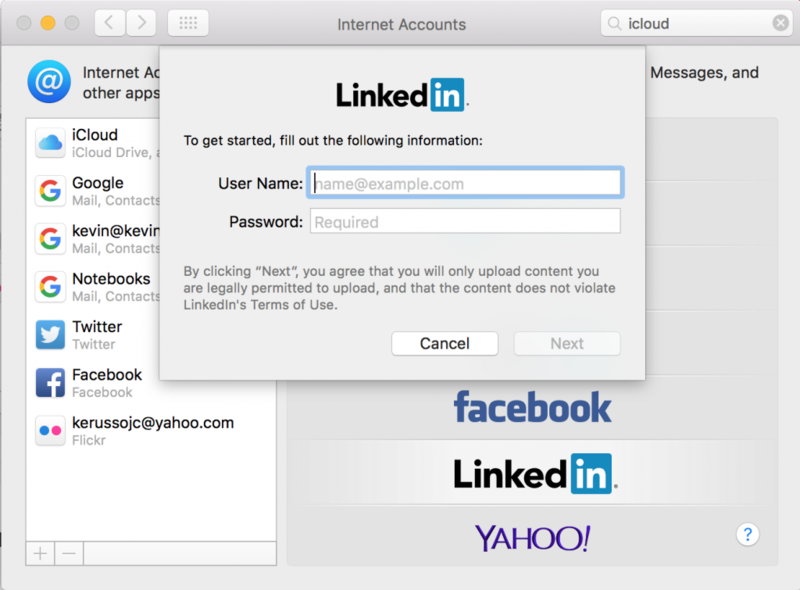 This lets users add third-party Internet accounts like Gmail, Yahoo and more. Add your Gmail, Yahoo, Facebook, Twitter or other third-party Internet accounts here. If you haven’t already, you can add iCloud here too. Most people will add things like Gmail, Facebook, or Twitter here. The user needs their login information. Users who have a Microsoft Exchange account for work or school can add it here too. Click on the icon for the service you want to add. Enter the user name and password for the account and click on Next. For a few of these, clicking the icon brings up a login page from the service. Yahoo does this. Add the user name or email address and the password and sign in. 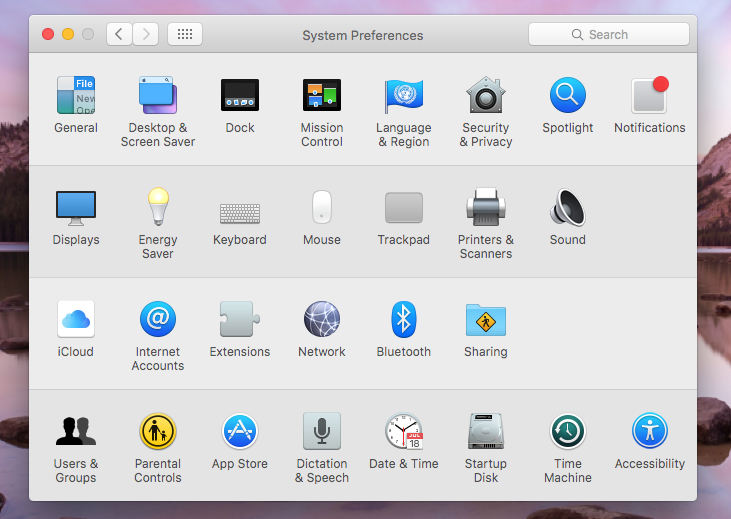 The System Preferences app houses all of the major system settings. Its icon looks like a black and gray gear and sits in the dock. It’s also accessible from the Apple menu in the upper left corner on the Menu Bar. If you ever need to find a particular setting but can’t remember where it is, enter the setting name in the Search box. In addition to the settings mentioned in the previous link, look at the following changes to make. I usually start with the top row of settings and open and set things as I prefer. The General and Desktop & Screen Saver stay the same on my systems since I like the default settings, but you may prefer to open those to customize the look of OS X. I start with the Dock settings. Shrink the Dock so that it takes up less screen space. Turn off or change the Dock magnification settings. When the cursor hovers over the dock it will grow in size so the user can see the icon better. This annoys a lot of people so uncheck the check box if that describes you. People with poor eyesight like me instead set this so the icons grow large. Change the position of the dock if you like. I prefer it along the bottom, but some want it on the left edge or right edge of the screen. 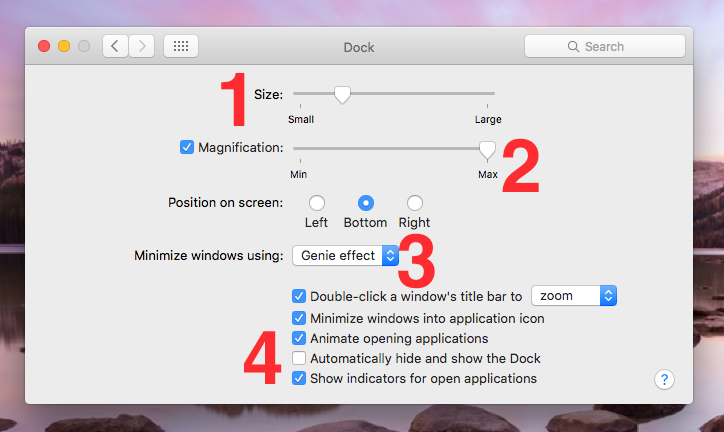 Change the five check boxes below the Dock position setting as you prefer. One that many like to change is the fourth item on the list. Check it to make the Dock go away until you hover over the bottom edge of the screen with the mouse. 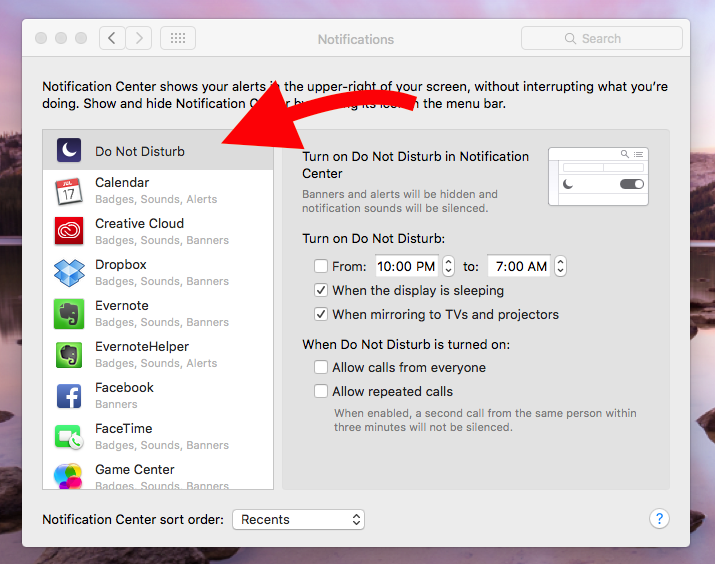 If your MacBook gets plugged in and left on in your bedroom or dorm room, open the Notifications setting and turn on the Do Not Disturb feature. Users can set a time to turn on/off Do Not Disturb automatically. This keeps the computer from making noise or notifying the user about things like appointments. Also, the user can just turn it off when the screen is in sleep mode or when the user mirrors the display to a TV or a projector, either through AirPlay and Apple TV or through the display output connections (HDMI or mini-Display). The bottom two items allow for exceptions letting the two categories of notifications through even when Do Not Disturb is on. Next, open the Energy Saver setting. It organizes things into two tabs, Battery and Power Adapter. Set the slider labelled Turn display off after: in each tab to your preferred level. I don’t like the default of 2 minutes when running on battery, but some may wish to leave it here to get more battery life. I change it to 5 minutes. While plugged into a Power Adapter, I set it to turn off the display after 1 hour, longer than the default. I do this because I only have the computer open and plugged in when I’m making presentations or need it to stay on. Finally, I make sure that the Show battery status in menu bar gets checked. 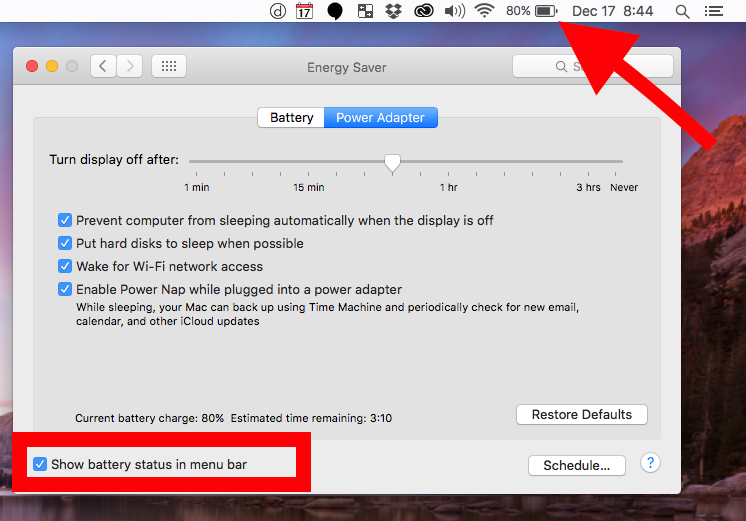 This puts a battery life indicator in the Menu Bar at the top of the screen. That’s the default, so leave it unless you don’t want it showing up on the Menu Bar. I also like to prevent the computer from going to sleep when the display is turned off while plugged in. I do that so that one piece of software, which I install, perform maintenance overnight. The Keyboard settings lets users change things like Key Repeat, shortcuts and more. Open the Setting and select the Keyboard tab first. Here’s what I change. I increase the Key Repeat rate and the Delay Until Repeat. This makes the input cursor work faster when I press and hold a key like the space bar to enter a bunch of spaces repeated. Change the length of time the keyboard backlight turns off. Increase it if you don’t care about battery life or decrease it to get more battery life. Show Keyboard puts a keyboard icon in the Menu Bar if you need to change between various keyboards, like from English to another language. On the Text tab, I add keyboard shortcuts for commonly used text strings like my phone number, address, email addresses, and website addresses. Click on the plus icon below the list of text replacements. First, enter the shortcut in the box that shows up in the left hand column. For example, if you’re adding a shortcut for your email address, enter the first part of the email. I put the first few letters of my email addresses. If the address is [email protected] then enter something like [email protected] Then in the second box at the bottom of the right side column enter the full email address. On the same tab, some people hate the automatic replacements and turn this off by unchecking the box. If you do this, the replacement shortcuts you just set up will not work. The other two tabs let you add shortcuts in programs and add additional keyboard languages. I never change these. 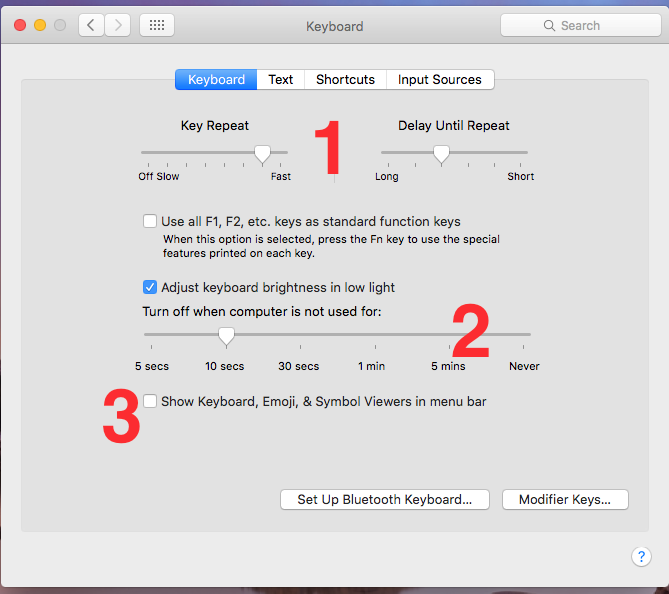 Apple offers a ton of built-in keyboard shortcuts that will speed up your work. 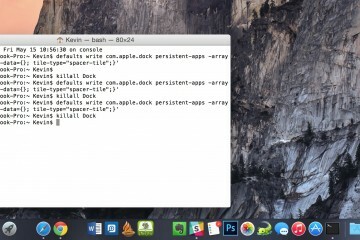 Learning these can help users become more proficient in OS X. 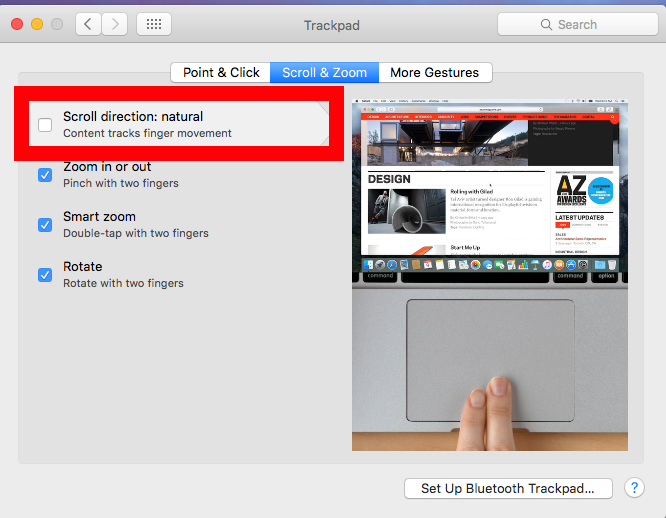 In the Mouse and Trackpad settings pages, many people turn off Apple’s Natural Scrolling which scrolls backwards compared to the traditional way of scrolling. If you try scrolling and it feels like it’s going backwards, you will want to change this setting. Open the Mouse or the Trackpad settings, whichever you’re using. Click on the middle tab labelled Scroll & Zoom. Uncheck or check the Scroll direction: natural item at the top of the list of check boxes. 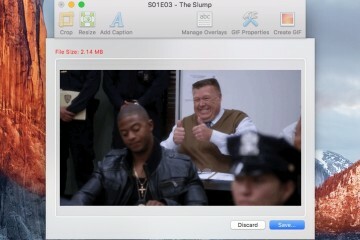 The animated GIF on the right shows how to use the Trackpad or Mouse the way you have it set. Check out the other two tabs and change things as you prefer in those places. If you own a printer, open the Printers & Scanners setting to add your printer and change its settings. Use the plus icon to add a new printer. If you plug in the printer’s USB cable, it should find the software and install it. If it doesn’t, you’ll need to install the printer/scanner drivers that came with it. Next, open the Users & Groups setting. Find your user name setup during the first boot section above. Click on Login Items. This shows a list of programs or apps that will load automatically each time you log into your user account. If you see something you don’t need, select it and click on the minus button beneath the list box to remove it. Unchecking the box only makes it load without showing your things like splash screens. This might speed up the computer a bit, if a bunch of these load. You won’t see that many things on the list until you start installing software. 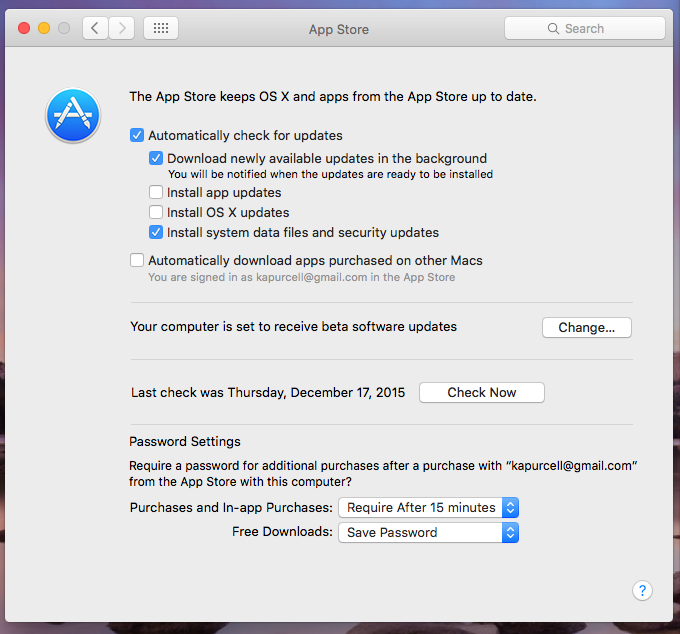 Do you want to stop OS X from installing app and operating system updates? Open the App Store setting and uncheck any of the items in the list you want to turn off. For example, some like getting notified of app updates, but don’t want them to download or to install automatically. I like to automatically check for updates and have them download in the background, but I want to decide when to install them. However, I want system data files and security updates installed automatically so my system’s never vulnerable to security problems. Don’t forget to set up Time Machine. This backs up your MacBook every hour so you never lose data. It only works when you’re connected to an external hard drive, so make sure to plug in periodically to your backup drive. Plug in the drive and then open the Time Machine setting, if the operating system doesn’t offer to open it for you. Turn Time Machine on (see #1 above) and then select the drive (#2) to back up the system to (if it didn’t open when you plugged in your new drive). If you want access to Time Machine, without opening System Preferences, then check the box (#3) at the bottom of the screen to turn on the Menu Bar icon. Open the App Store and click on the Updates tab. If you didn’t already get the latest versions of the operating system and apps from the Mac App Store above, do so now. Open the Mac App Store and click on the Updates tab on the right end of the toolbar at top. Let it search for updates and download them. If the computer includes an operating system update, it will ask to Download and Restart. Let it and go take a break until it finishes. This take up to 30 minutes depending on how fast your MacBook runs. Other apps won’t ask to restart the system, but often the user will need to exit apps running in the background. You likely won’t have many of those installed at this early point. The first accessories users should consider getting include a nice computer bag, a mouse, MacBook cover, dongles and other useful devices. Here’s a list to consider. 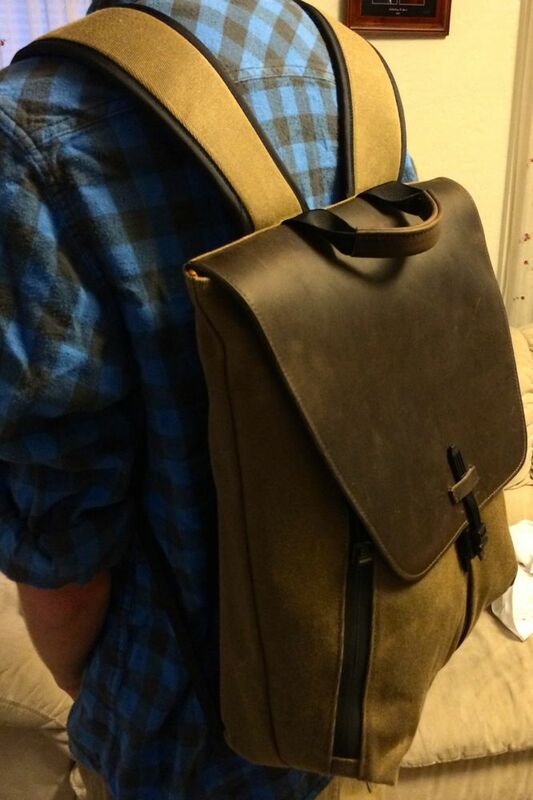 MacBook computer bag – we like WaterField Designs computer bags. My current favorite is the Bolt Briefcase or the Staad Backpack. MacBook cover – we really like the Moshi iGlaze for the MacBook Pro. Moshi carries other MacBook covers and cases too. Mouse – the MacBook glass trackpad is the best in the industry, but some people still prefer a mouse. The Logitech Ultrathin Mouse (link shows other cool accessories too) is my favorite. It works a lot like the Apple Magic Mouse but is smaller. Dongles and Adapters – Apple loves dongles for some reason. If you’ve got a new MacBook with the Type-C USB connector, you’ll need dongles to connect to HDMI, regular USB, VGA, DVI or Ethernet. Twelvesouth PlugBug World – This adds a USB charger port on your MacBook charger. The MacBook charger comes with a detachable piece that holds the AC connector so users can swap out International connectors. Twelvesouth uses this design to substitute their PlugBug that includes a USB port. 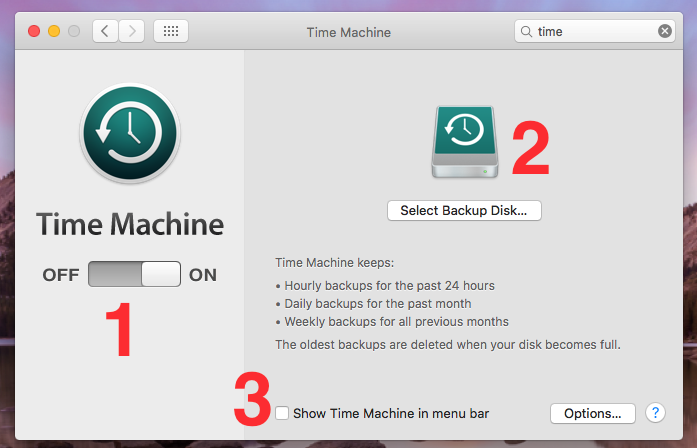 Backup Storage – We talked about setting up Time Machine above. A fast external hard drive will make this a better experience. Look for a few things. 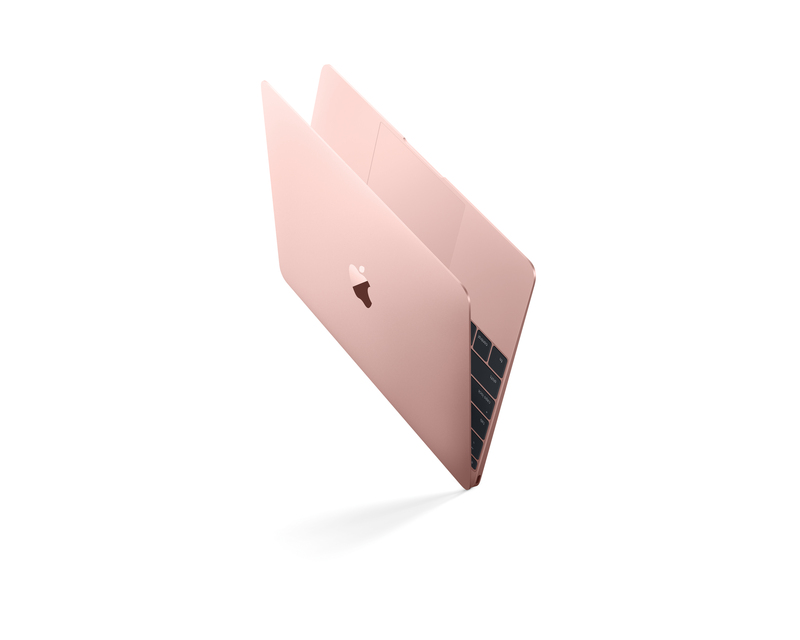 If you can afford it, buy an SSD that matches the MacBook’s storage size. If you have a 256GB drive in your MacBook, then get at least a 256Gb external drive. If cost is the most important thing, then grab a large drive like the 1TB drive. They cost $50-$75 for slower portable drives. 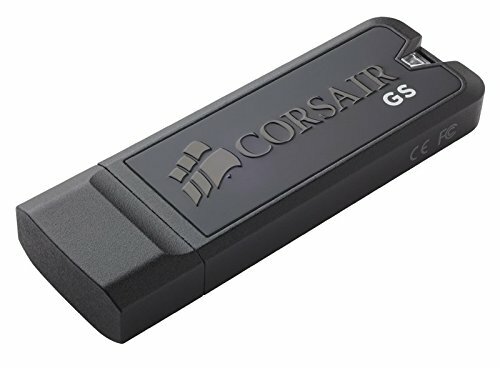 This Corsair 512 USB Flash Drive costs over $300 but it will let you back up your MacBook in an extremely portable way. Apple TV – The new Apple TV is a great streaming set-top box all by itself, but paired with a MacBook via AirPlay it becomes a second display for doing presentations or watching media stored on your Mac. You can also import the videos into iTunes and use the Apple TV’s feature that lets it stream media from iTunes on the Mac. It also plays games and lets users install other third-party apps. Now it’s time to install your favorite software and apps (see our list of 18 and our list of 70 great Mac apps). Then enjoy your new MacBook.